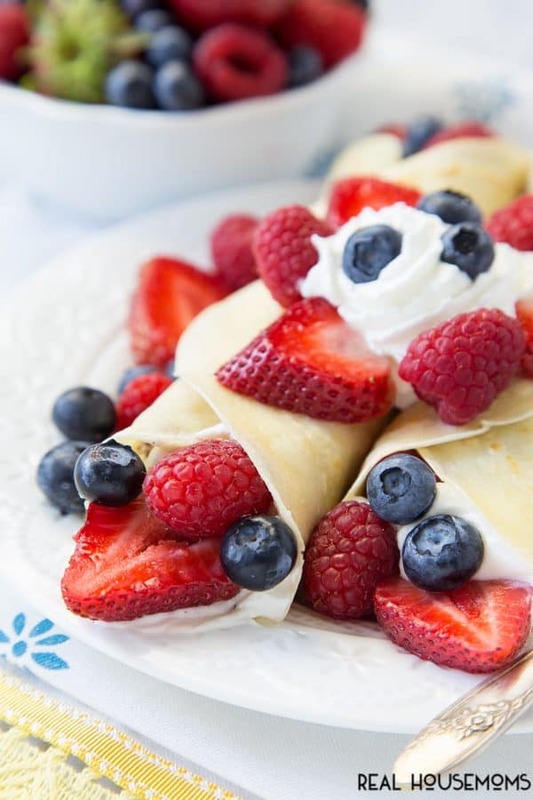 TRIPLE BERRY CREPES are a breeze to make and look so elegant! This easy recipe is sure to please! Today’s recipe is one of those – oh I couldn’t do that – but I’m here today to say yes you can recipes! Making the crepes is so much easier than it looks. 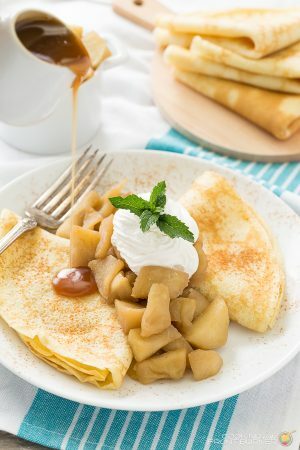 If you can make a pancake, you can learn how to make these as well. 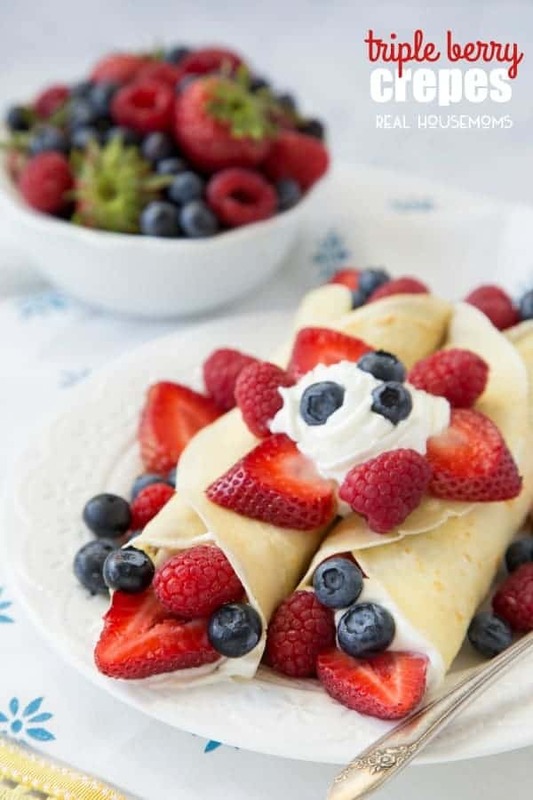 And these are just perfect with a blend of triple berries and fresh whipped cream that has some lemon curd added for that extra zing. Impress your guests with this delightful dessert and feel free to take all the credit! OH! Make sure you keep reading all the way to the end! We have a fun surprise waiting for you! Trust me! You don’t want to miss this, unless you don’t like cash, then maybe you don’t have to! Once you mix up the batter, it will resemble a thin pancake batter. It’s best to make it up and let is sit out for about 30 minutes before making the actual crepe. All you need for that part is a non-stick 8″ skillet; just heat it up over medium heat and then place about 1/3 cup of batter in and swirl around until the bottom is coated. You will notice the edges get a little dry and in about 1 1/2 to 2 minutes flip over and cook for about the same amount of time (they should be a light brown color). Having the skillet preheated will prevent anything sticking. 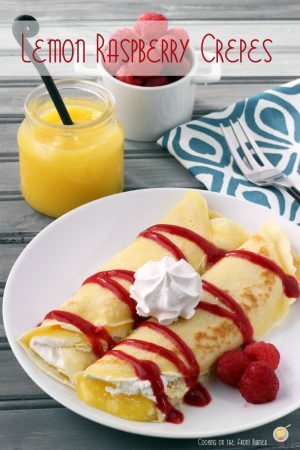 You can make the crepes ahead of time and keep in the refrigerator just be sure to place wax paper between crepes and wrap in plastic wrap to keep from drying out. Now these are called Triple Berry but you could certainly add in some blackberries and go for the quad! Or just mix and match as you please. The whipped cream with lemon curd really helps marry the whole crepe together and you can’t see it but I used a bit of the cream to glue the top down. Another trick that works well is placing your mixing bowl and beaters in the freezer for about 10 minutes before whipping the cream. I happen to have a kitchen aid mixer with a steel bowl and it takes no time at all to get it to come together. So are you convinced to give them a try? We would love to know if you do and we’re always here to answer questions as well! Enjoy!! 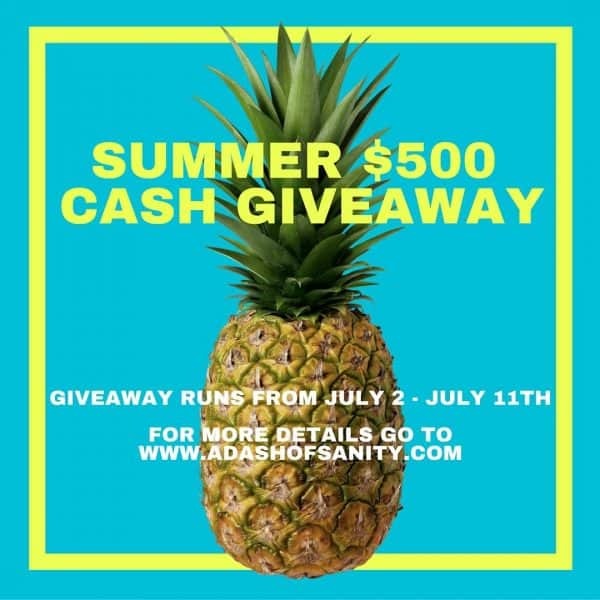 Keep scrolling for the for that super awesome cash something…….. 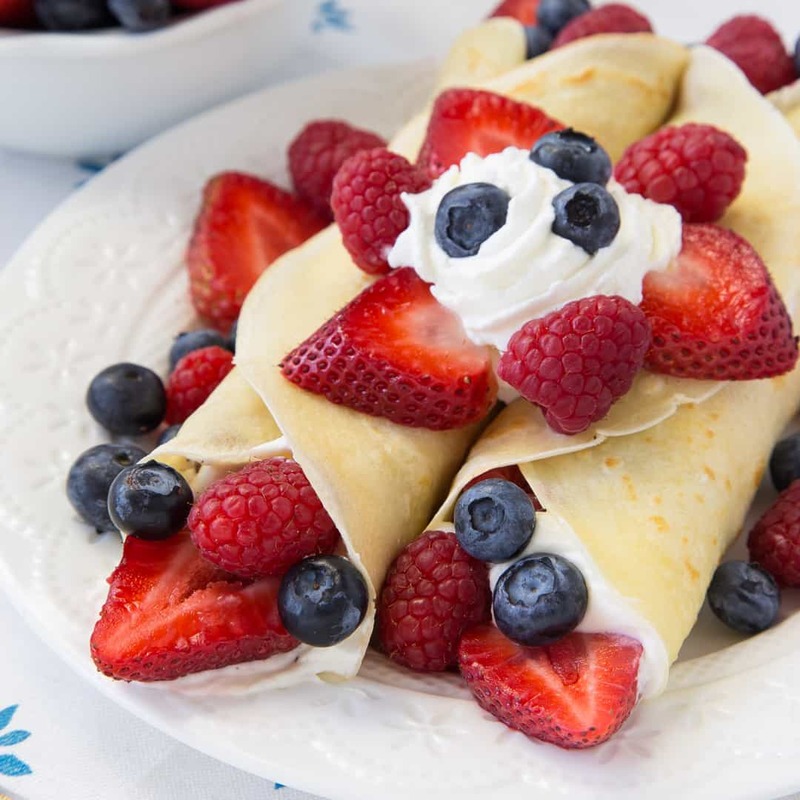 Triple Berry Crepes are a breeze to make and look so elegant! 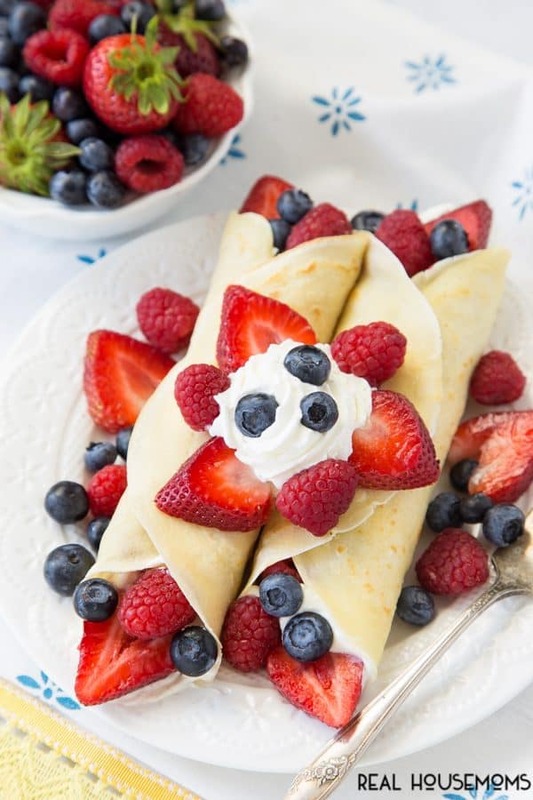 Loaded with your favorite berries and a lemon curd whipped cream. Over medium heat, heat skillet until hot. 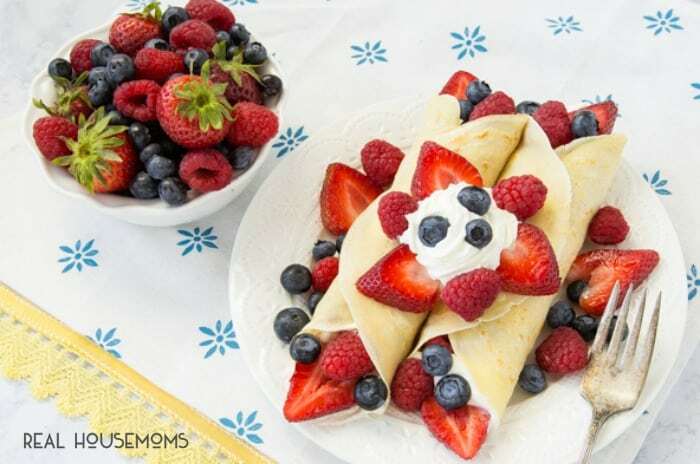 Place berries (about 8 blueberries, 4 raspberries and 2 strawberries that have been sliced) on top and then roll up. You made it!!!! It was totally worth it wasn’t it?! It’s super simple to enter! Just follow the instructions and you’re done! The giveaway lasts until 11:59 PM on July 2nd, but seriously don’t put it off like I usually do. I always forget, always!!! I’m the worst procrastinator! Just ask Sandra from A Dash of Sanity! 😉 I almost forgot to share this giveaway with you all!!! OK you awesome people, click the little links below and get entering! I hope it’s one of you guys that wins this awesome prize! This recipe sounds amazing and I am going to be trying it this weekend. Thank you for sharing it and the wonderful giveaway!